So, if you missed the last post in VivaGlobetrotting now is probably a good time to go back… Here we will be reviewing the Union San Felipe years throughout our series. Alejandro Hurtado joined San Felipe back in 2017 after a difficult start to his managerial career. He was sacked just six months into his first post in management with Deportes Puerto Montt. Hurtado left Union San Felipe in 2023 to move on to a different club, but his six years have made a huge impact on the Chilean club. The final section of this post will be dedicated to the changes Hurtado has made throughout his six year reign. But let’s start by reviewing how the club has progressed over Hurtado’s reign in charge, year-by-year. 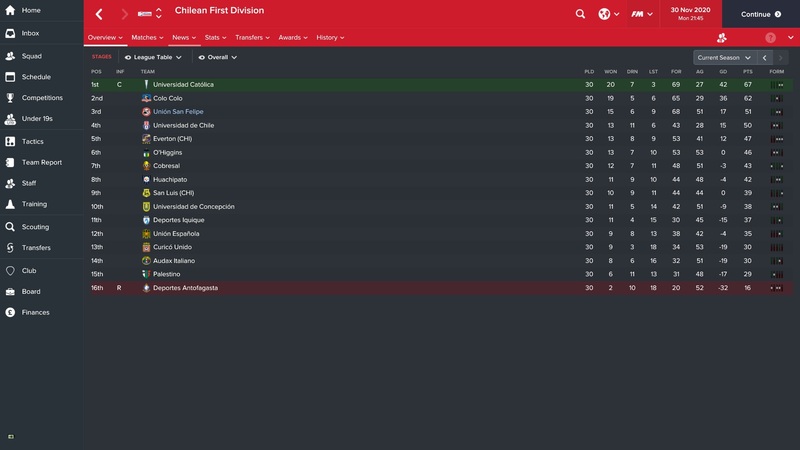 Anyone thinking of starting a save in Chile should definitely check out my post on TheHigherTempoPress here. I discuss how the format of the league will change over the first two years of the save. I think it’s fair to say that Hurtado was bought into the club at the deep end. Union San Felipe ended the 2016/2017 campaign winning just 1 game in the Closing Stage. Hurtado joined the club at the end of April 2017, leaving him with three months before his first matches in charge. A couple of players stood out to Hurtado over his first few months in charge. Ignacio and Juan Jeraldino, both 21, were imposing forward players who had potential to lead the line for El Uni-Uni for years to come. Eduardo Farias was one of Hurtado’s first signings. He would go on to become the rock at the back for USF over the next few year and remains at the club in 2023. These two players were vital in San Felipe’s first season as they lead USF to first place in the league. Unfortunately Union San Felipe were unable to earn promotion through the 2017 playoff, losing out to Universidad de Concepcion despite a semi-final win against Coquimbo Unido. Alejandro Hurtado lead his side to promotion in his second year in charge. Union San Felipe won the league by seven points over Deportes La Serena. Juan Jeraldino was instrumental this season, scoring 24 goals and assisting 10. Due to the January restricted transfer window, the squad to play the first half of the season would be largely the same squad to have earned promotion. A couple of signings were made, including Mario Alonso on a free. Alonso would go on to be sold for £1M to Patronato just 1 year later. In addition to Alonso we bought in Josue. This Brazilian centre-back would become a vital part of the defensive unit. 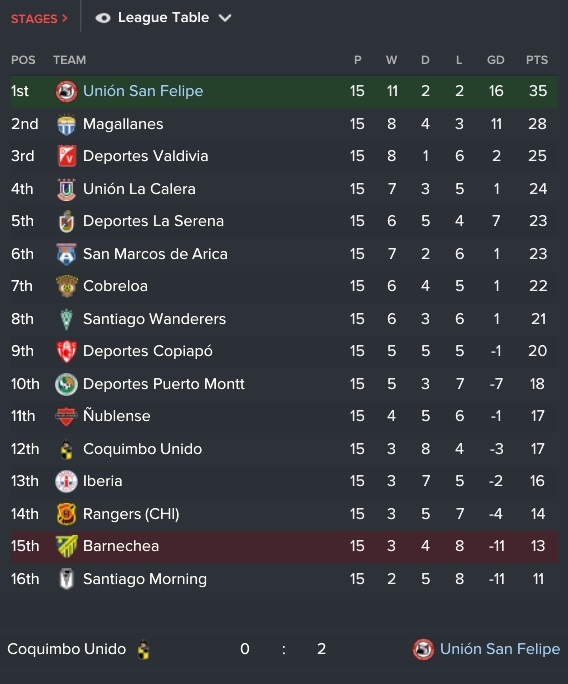 Union San Felipe finished in 5th place in their first year back in the Primera. A successful season under Hurtado’s leadership. In June 2020 Hurtado made three very important signings, Miguel Vargas, Nozomi Kimura and Merival. Miguel Vargas, a goalkeeper, was bought in on a free and became Union San Felipe’s first choice goalkeeper for the next few years. He even made a few caps for Chile under Hurtado’s management. Nozomi Kimura became the rock at the back that Eduardo Farias was over the first few seasons in the Primera B. Again Kimura was bought in on a free, highlighting Hurtado’s skill in the transfer market. Attacking midfielder Merival was bought in for just under £5K, and although he never set the world alight with his performances, he was an important squad member for USF in their title winning campaign of 2022. A fantastic season saw Union San Felipe get third place, securing Copa Libertadores status for the following year. In the Copa Libertadores we fell at the first hurdle, the 1st Preliminary Round, against Colombian side Millonarios. We struggled in the league too. It’s fair to say that 2021 was a difficult year for Hurtado and his men. A year that included nine straight league defeats..
A 9th place finish meant no continental competition for Union San Felipe in 2022. From 2021 onwards Hurtado started to spend a bit more money in the transfer market, signing Alejandro Fuentes and Fabricio Oya for a combined fee of over £650K. Less than a year later, Fuentes was sold to Braga for £2M and Oya was sold for a club record £2.7M. Two very impressive sales that helped to fund several facility developments at the club. Champions! Union San Felipe won the Primera Division in 2022. 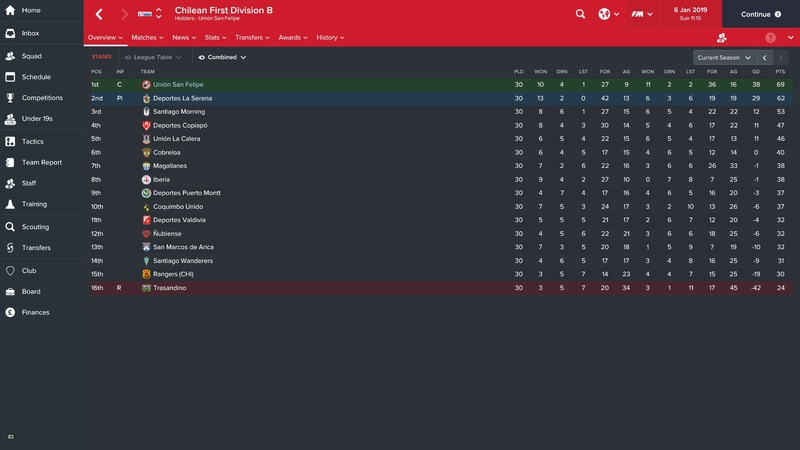 This came after an incredible start to the season, winning 16 of the first 17 league games. Marailton was bought in for a record £1.5M from Brazil and became the focal point in centre attacking mid. A brilliant season for Hurtado and his side. Alejandro Hurtado went into the 2023 season knowing that it may well be his last with San Felipe. After the league success that came last season, Hurtado knew it would be difficult to top. However playing in the Copa Libertadores group stages tempted Hurtado into one final season, as well as the fact that he has yet to win the Chile Cup as a manager. Union San Felipe went the first 22 matches unbeaten before losing their form and sliding down to third position. This was in no way a failure, ending with just two points fewer that their title winning season. 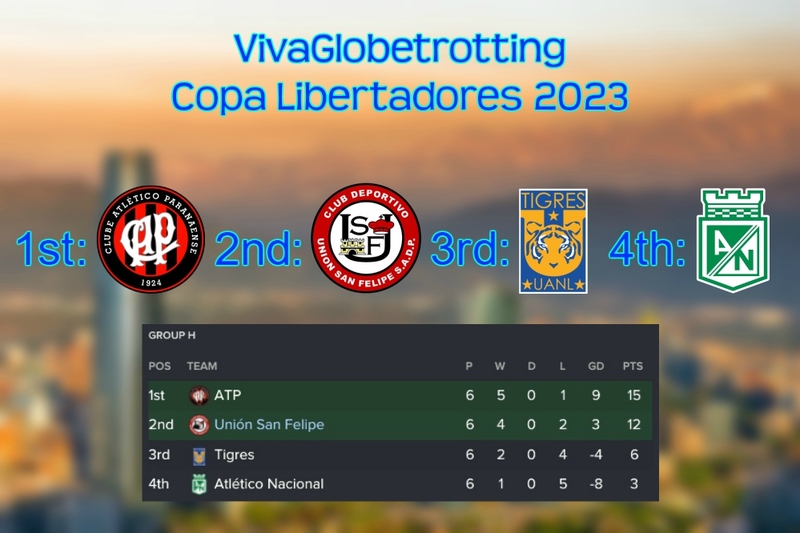 In the Copa Libertadores USF enjoyed their group stage, finishing second in the group and progressing to the knockouts. This far surpassed the expectations of the board, fans and indeed Hurtado himself. We came up against Flamengo in the next round but lost over two legs. In the Chile Cup we fell in the Quarter Finals, losing on penalties to Colo Colo.
Alejandro Hurtado has clearly made an impressive impact on the stature of Union San Felipe. Not only has he lead his side to Primera Division glory, he has also ensured financial stability, increased the clubs fan base, expanded the clubs backroom staff and improved the clubs facilities. Let’s take a look at the progression of USF from 2017 when Hurtado joined to 2023 when Hurtado leaves. Union San Felipe have gone from having just 8 staff members in 2017 to having 39 by 2023. These 39 staff members are considered the best of the Primera, something in which Hurtado can be very proud of. One of the most significant aspects of Hurtado’s reign has been his willingness to request for an improvement in facilities. Alejandro has taken the club so far in his six years in charge. Speaking solely in terms of value, Union San Felipe are worth around 60 times as much as they were 6 six years ago. They are now worth £8.25M. The fan base has increased too with the club now attracting 526 season ticket holders as opposed to the 135 they had in 2017. Just three players have stayed at the club throughout the entire time Hurtado has been in charge. Two of these players are easily guessable in the Jeraldino twins. The third player is goalkeeper Andres Fernandez. Fernandez was first-choice for USF until Vargas was brought in. Nonetheless Fernandez has hung around the club and provided back-up when needed. As you can see, none of the players have shown any remarkable improvements over their time under Hurtado. However this could be due to the fact that these screenshots are taken either side of their prime years. What interests me is seeing their appearances in the bottom left. 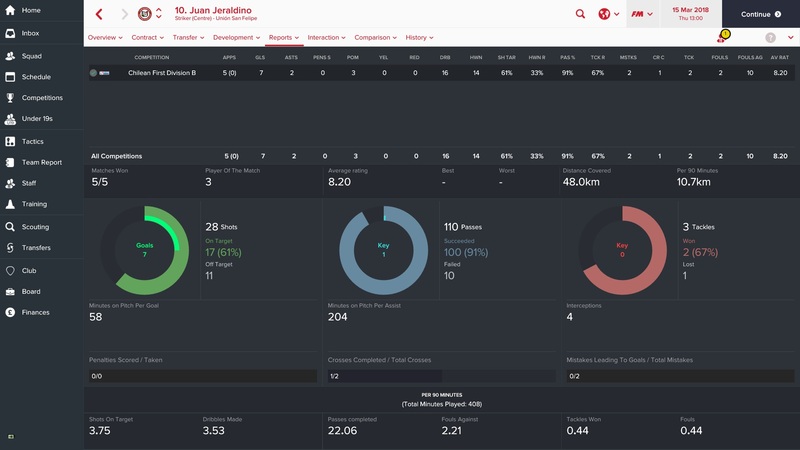 Juan Jeraldino the star of the series so far, scoring 120 league goals for us since joining. The final aspect of the club we will look at is the records set under Hurtado. I love seeing this. Alejandro Hurtado has developed as a manager so well throughout his time at Union San Felipe. The young manager is very well set to become one of the greatest managers to have come from South America. Thanks a lot for reading this heavy post. It has been a pleasure playing with Union San Felipe, and to have got them to the stage that they are now is truly satisfying. But now we move on to another challenge in a new country. Will you be joining us on the journey? This entry was posted in FM17 Stories, Football Manager 2017, VivaG Chile, VivaGlobetrotting and tagged alejandro hurtado, andres fernandez, copa libertadores, fm stories, fm17, football manager, ignacio jeraldino, juan jeraldino, primera division, south america, union san felipe, VivaG Chile. Bookmark the permalink.